I got my first cell phone in seventh grade. It was colorless and I spruced it up with rhinestones and charms. Fortunately, phones are a lot nicer now, and have become valuable tools we take with us everywhere. It’s no wonder kids want their own cell phones, too. And with back-to-school season upon us, you might be looking for the best cell phone plans for kids that provide a sense of freedom without costing too much money. Unfortunately, it’s not easy to find the best phone plans for kids. There are many companies to choose from and some plans are far too expensive. Not to mention, some plans have far more than a child needs, especially for their first cell phone. Thankfully, there are enough carriers who provide cheap phone plans for kids so you can get your kid a phone without breaking the budget. You probably don’t want to spend a ton of money on your kid’s cell phone plan and I don’t blame you. It can be difficult to find a good phone plan for your child but it’s not impossible. Here are five of the best cell phone plans for kids. Tello is a prepaid cell phone service provider with flexible plans and low rates – perfect for kids! There are no contracts, no activation fees, no early termination fees and customers get nationwide 4G LTE coverage provided by Sprint’s network. Plans start as low as $5 per month and you can customize your plan based on how much data or talking minutes you need. This allows you to choose exactly what you want without having to pay for something your family does not need. There are several plans that have unlimited talk and text. However, if you know your child isn’t going to be making too many phone calls, you can create a plan that has 200 minutes to talk, free texting, and 1G of data for just $10 per month. You can bring your own phone when you sign up for Tello or buy one of their LG, Motorola, or iPhones. Their phones range in price but can accommodate any budget. Republic Wireless is my personal favorite prepaid cell phone company. I’ve been using it for three years, and it’s also great for kids because the plans are flexible and cheap. You can customize your plan and cancel at any time. Their plans start at $15 per month for unlimited talk and text, which is a great feature. You can also add data for $5 per month per GB of data. Republic Wireless relies heavily on Wi-Fi to keep costs down for both talking and data. When not using Wi-Fi, Republic Wireless uses the Sprint or T-Mobile network. You can bring your own phone to Republic Wireless, or you can purchase one from them. If your looking for a simple phone plan for your child so you can simply keep tabs on them, Republic Wireless is a great option. Mint Mobile also has cheap cell phone plans for kids starting at $15 per month. Like other Mobile Virtual Network Operator (MVNOs), Mint Mobile piggybacks on a major carrier to provide service. In their case, they operate on the T-Mobile network. With their cell phone plans, you get 4G LTE high-speed data, unlimited talk and text, a free SIM card, nationwide coverage, and a mobile hotspot. However, Mint Mobile is unique when it comes to their pricing. They sell plans in bulk or in three, six, or twelve month increments. The pricing is good to start, but when you renew, it can get a bit more confusing as the pricing increases quite a bit. For example, if you choose another three month plan you’re rate will increase by at least $24 if you choose their 2GB plan. The best way to lock in the lowest price is to sign-up for a 12 month commitment upfront. The confusing renewal pricing aside, the free trial and lower pricing makes Mint Mobile worthy of consideration vs. other cheap phone plans. You can bring your own phone and try the service out for free for seven days to see how you like it. Twigby is a pay-as-you-go phone service provider that offers a 25 percent discount for the first six months of service. With Twigby, you can change your plan whenever you want. They also operate on both the Verizon and Sprint networks, giving them better coverage than other providers. If you upgrade your plan, you’ll only be charged the difference in the next plan’s price. For example, if you start your child out with 300 minutes per month and 600 MB of data, you’ll pay $11.25 plus tax per month for the first six months. If your child needs more minutes or data, you can upgrade at any time and pay the difference. Unlimited global texting is free and you can upgrade to unlimited talk for just $15 per month. Twigby also has free overage protection and family plan options for everyone in the household. Virgin Mobile has been around for a while and their cell phone plans have always been fairly affordable. It operates on the Sprint network, allowing them to offer good coverage. Virgin Mobile has no annual contract, no hidden fees, and a 14-day guarantee. The downside with Virgin Mobile is they only offer one plan, and it costs $50 per month for unlimited talk, text, and data. This may make them a better fit for teens rather than younger kids who need a cell phone plan. Right now, they’re running a promotion where if you buy an iPhone and start your service, you’ll have a $1 phone bill for the first six months then $50 per month after the promotional period ends. Unless you have an older phone to provide your child, you will need to buy a new phone. Choosing the right phone can be just as important as choosing a good cell phone plan. Many of the above carriers, in addition to other cheap cell phone plans offered by other providers, allow you to bring your own phone. Not each carrier is equal in the selection of phones they offer. Your child might want a $1,000 iPhone but that is a waste of money. All you need is an unlocked phone that works with your chosen carrier. You can find unlocked cell phones on Amazon as well as eBay and other online retailers. Getting your child a cell phone can be beneficial in many ways. If you feel they’re responsible enough to have one, it can be a great way to communicate when you’re not around, particularly if they stay after school for activities or ride the bus. But you don’t want to create another huge bill simply so your child can have a cell phone. Fortunately, there are many options when it comes to choosing the best cell phone plans for kids. Since kids like data and apps, I love how all these phone plans have quality and reliable data options along with flexible talk and text features. Starting with a prepaid phone service is ideal because you can customize your plan based on what your child needs and you don’t have worry about getting locked into a contract. What are some other cheap cell phone plans for kids you’ve tried? How old was your child when you bought them their first cell phone? Do you allow your child to have data access on their phone? 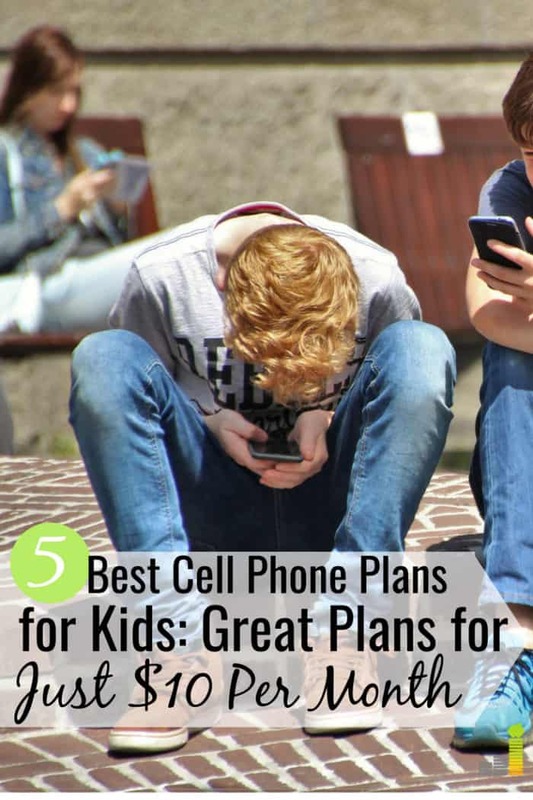 The post 5 Best Cell Phone Plans For Kids and Teens appeared first on Frugal Rules.